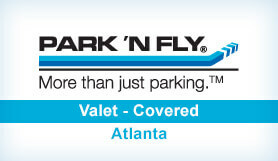 The Park ‘N Fly Plus valet service at Atlanta Airport is the best choice for those in search of speed and security, as it offers both luxury and peace of mind. Their deluxe customer experience gives you everything you need to start your journey on the right foot, including a special text-based pickup system, a shuttle to the terminal, and premium luggage assistance. Because the parking lot is covered, you can be certain your car will be protected while you’re away. Park ‘N Fly Plus even offer extra packages like Jiffy Lube services, a deluxe hand car wash, and boarding pass printing – so you can create the perfect parking solution for you. Please will pull a ticket from the entry column when you enter Atlanta Park ‘N Fly.